I had the porterhouse, simply because I wanted to mix it up. I had the ribeye at the other location, and was hoping for a better experience here for our anniversary. They likely use the same supplier for their beef, and have the exact same menu, so by that logic I figured I might as well try something different. It was good, but not great. There were one or two bites that were just odd and bad tasting. Perhaps due to gristle proximity. I ordered medium rare but it came medium. I didn’t mind that so much since there was still some pink, but others might get pissed off at something big like that. The steak should have rested a bit more, as there was a puddle of juices under it when it was served. It wasn’t sizzling, but it was on a hot plate. Perhaps it was a t-bone and not a true porterhouse, but the filet side did seem large enough. In hindsight I should have stuck with ribeye, or a dedicated strip. They have the essentials: strip, porterhouse, filet and ribeye. They also have a few variations on how they prepare them: au poivre, oscar, porcini rubbed, kona crusted, sliced with mushrooms, etc. Also, each is dry aged, so that is a bonus. Could have benefited from some flank or skirt selections. My porterhouse was 24oz, and the ribeye is 22oz. These are good sizes for steaks. For some appetizer items, however, there were some issues. The smoked salmon had four small to medium sized slices for $17 – seems lame. Also the crab meat app for $21 only had 4oz, which seemed too small. On the other hand, the sides and desserts were nicely sized portions. The prices here are really fair for NYC fare. The ribeye and porterhouse are $48 as opposed to $55 in some places, and it is exactly the same size. I guess being a chain steakhouse does have some benefit for the customer – similar to the point I made in my second trip to Ruth’s Chris. Also we had a discount for 30% off, because my wife is a-freaking-mazing when it comes to finding deals on stuff (our 3rd row theater tix were only $30 each too). I have also taken into consideration that the food was better here, thus making the price more “worth it” as opposed to the midtown location. 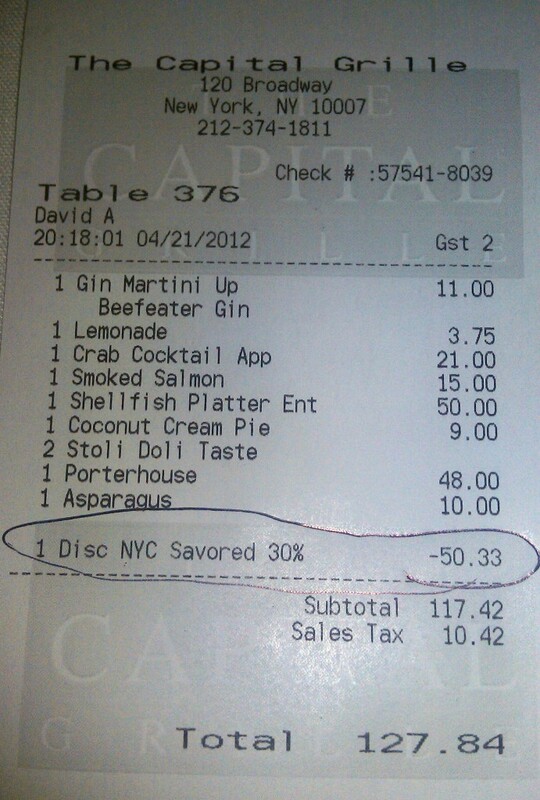 We saved $50 from the online deal at Savored, and we also got our coffee, tea, and dessert booze (Stoli Boli) for free. So our bill was only $127 after tax (2 drinks, 2 apps, 2 entrees, a side, and a dessert). The bar is a nice circular deal here, with high ceilings since he second floor overlooks it. It sits close to the open-windowed kitchen, so you can watch all the cooking (similar to Maloney & Porcelli). For $11 the martini is great – one of the cheaper martinis in all of NYC steakhouses, and it is made well. On special there was a scallops and broccoli rabe dish, and a king crab appetizer. I was expecting leg meat, but it was lump style, from the body. It was good but not worth $21. For other meats there is chicken, lamb, and other preparations of steaks not in the traditional steakhouse manner (see above). For example porcini rubbed delmonico, kona crusted dry aged sirloin, etc. Good for other meats, or at least other preparations of the same meats. I would have liked to see a special cut of steak though, or some variations like flank or skirt. We had the smoked salmon (delicious but small), and the special crab meat (expected leg meat but it was still good – just small) for apps. 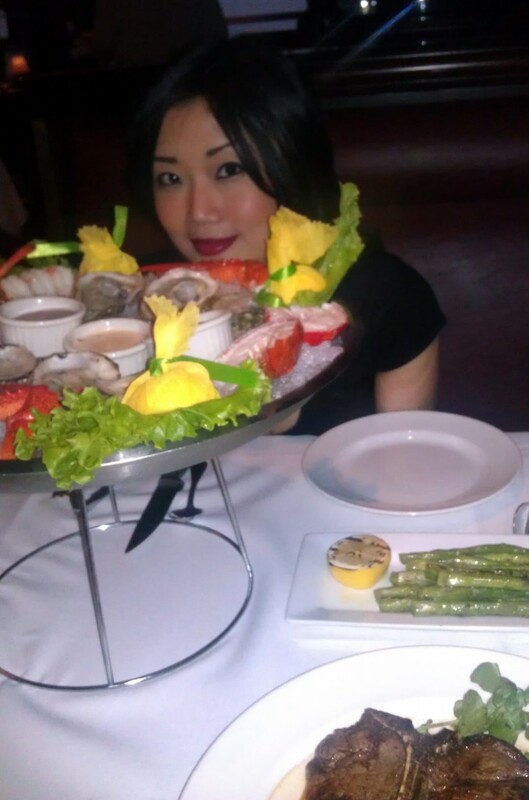 My wife had the shellfish plateau for her entree, which was a full half-pound lobster, shrimp, and six oysters. A bit pricey at $50, but it all tasted great. On the side we had grilled asparagus. I make better at home, but this was interesting in that it was served with a lemon oil. For dessert we had the coconut cream pie. It was awesome. I wish I still had room to finish it. It was served with a nice big coconut almond sugar cookie too, but the best part was he crust under the pie – soft yet crisp at the same time. Not too sweet – just right. This is essentially the same as the other restaurant. We tried the seafood tower, smoked salmon, and crab meat apps (see above and midtown review). Our waiter was great. He said Happy Anniversary to us several times. Despite getting a whopping 30% discount from Savored, they still gave us top notch attention. For dessert, they gave us complimentary Stoli Doli drinks (pineapple infused vodka that they soak fresh on site), and our coffee and tea were on the house as well. SWEET! The table breads were a good mix of onion loaf, seasoned rolls, pumpernickel raisin, and flat breads. The butter was soft and light, and seasoned fresh with salt and herbs/greenery. The ambiance at the Wall Street location is very similar to the midtown west location. The waiters and waitresses wear the classic bow ties. There is nice dark wood paneling on the walls, taxidermy and paintings on the walls, and a red patterned rug. The second floor has great views and a spacious set up. The music is a good selection of jazz. 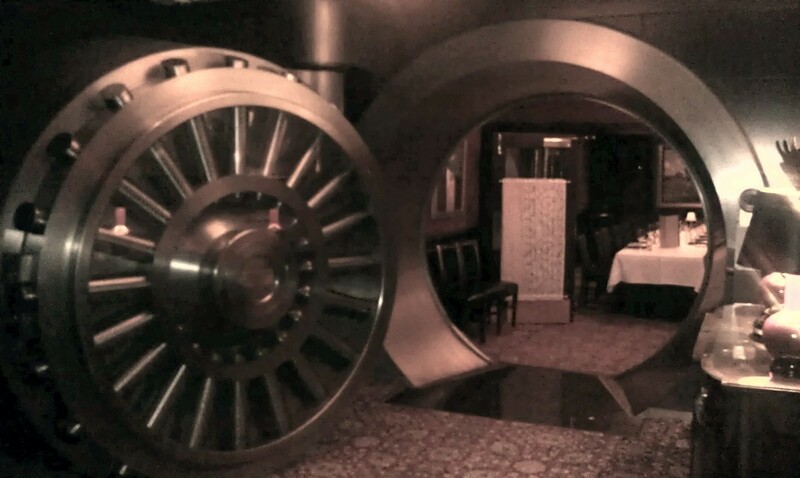 The bathroom had cool “Capital Grille” printed towelettes, and down on the lower level near the bathrooms is a great private dining room inside the old massive vault doors.